MC Property Maintenance provides a wide range of operated platforms for hire across the South of England including Sussex, Surrey and London. 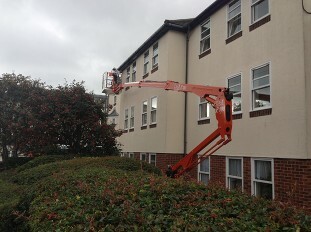 We can provide you with skilled operators who can control the cherry picker or platform, allowing you to get access to a high or awkward part of your building. Choosing to have the platform operated is a highly cost effective option if you are working on a project that will require constant movement of the access equipment. They can be used for a huge range of tasks including surveying, cleaning, painting, maintenance or even installation work. Our operatives are highly skilled, and experienced professionals who will provide all the support you require whilst they are on site. If you are interested in hiring operated access platforms or cherry pickers from MC Property Maintenance please don’t hesitate to contact us today on 01243 530 076 and a member of the team will be happy to provide any additional information you require. • Surveyors for quick and cost effective building inspections. • Pest prevention for the installation of bird spikes and netting to roof areas. • Tree surgeons for quick and easy access without the need of ropes. • Chimney sweeps for the installation of chimney flues and cowls. • Window cleaners for the cleaning of UPVC windows and building facades. • Plumbers for the installation of gas boiler flues and log burner flues at height. 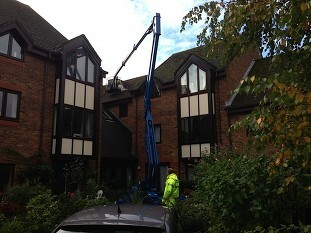 • Gutter cleaning, plantation growth and valley cleaning.